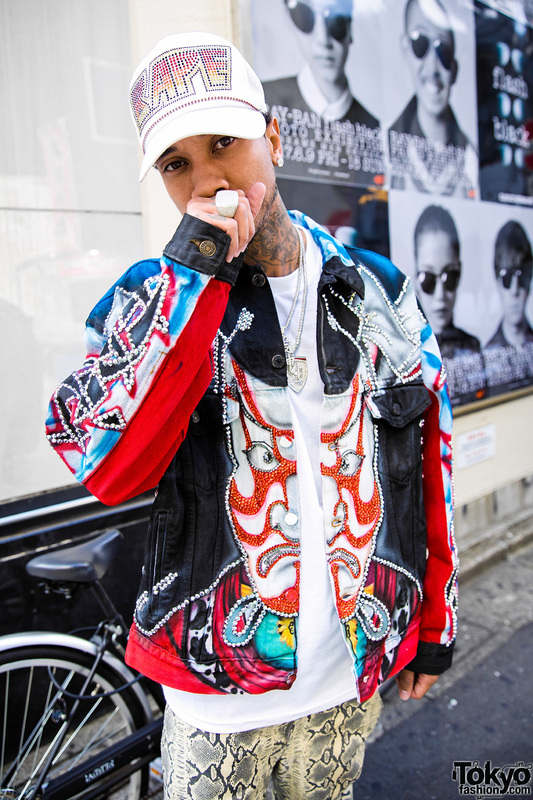 American rapper Tyga on the street in Tokyo’s Harajuku neighborhood wearing a kabuki artwork jacket, snakeskin pants, a Bathing Ape cap and sneakers. Tokyo girl in vintage street fashion from G2? Harajuku. Harajuku duo wearing vintage and antique fashion including a kimono sleeve jacket, Comme Des Garcons pants, and snakeskin heels. Taiwanese model in Harajuku with lilac hair and twin buns wearing an acid wash denim jacket with denim cutoffs, platform ankle boots and silver backpack. Harajuku girl with bob hair wearing a maxi skirt over a snakeskin print blouse with peep toe shoes and socks. 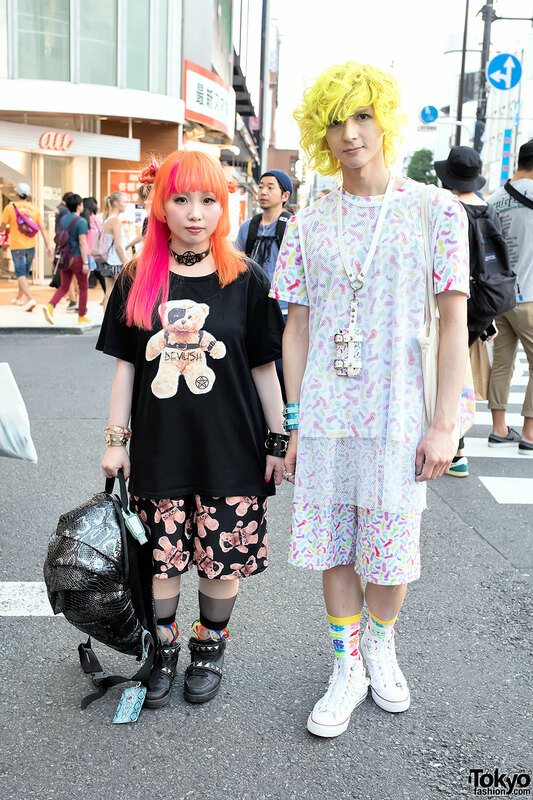 Fashion designers on the street in Harajuku with yellow, orange, and pink hair, graphic clothing, and lots of studded and spiked accessories. 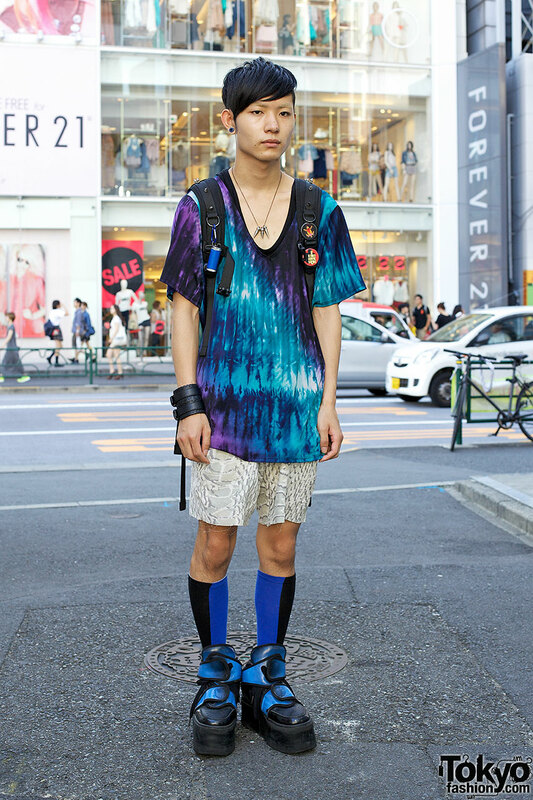 Tokyo student’s edgy street style featuring Dog Harajuku platform sneakers, Memento backpack & spike necklace. 18-year-old Bunka Fashion College student wearing a polka dot dress, rainbow snakeskin heels, and a large purple hairbow on the street in Tokyo. A stylish Japanese girl in Shibuya wearing a hat, dress, and snakeskin boots.